dessert made of phyllo dough, heaven, sugar and nuts. 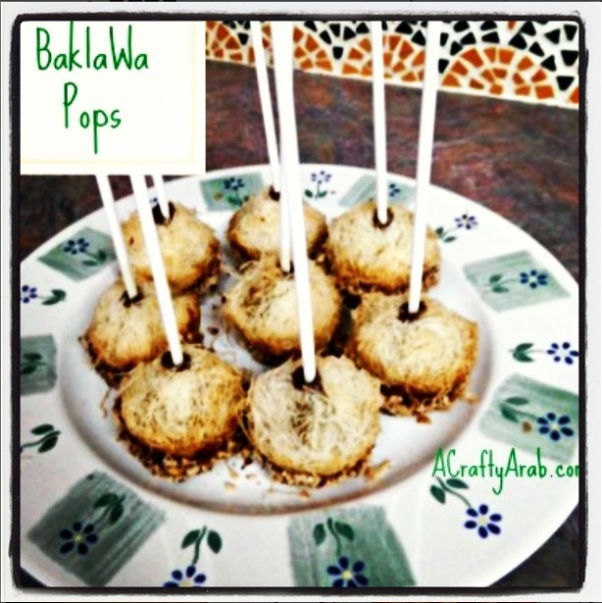 to the juicy tutorial of Baklawa Pops I made for my Arabic book club tonight. We are discussing Anthony Shahid’s House of Stone, btw. a mixing bowl for easy access. ball. Place on parchment paper. Make 48 half balls. the Katifi until it’s well buttered and shape into a bird’s next in your palm. Pick up one half ball and put it rounded side down in the middle and pick up a second and put it flat side down, so you have a full ball shape. the Baklawa Pop in your small muffin pan and bake for 20 minutes. chocolate and then put it back into the hole. The chocolate is a tasty glue for your Balklawa Pop while you are holding this deliciousness and munching away. Call your neighbor over and share your special treat! These lovely Eid decorations below were originally created for an Easter party by Wendy over at Green Beansie Ink. You can see all the fun Easter party stuff she did at Catch My Party. She gave me permission to turn her images into an entire Eid party. Here is a post that includes free downloads of all Eid party decorations below. Thanks Wendy!